Kleinbasel (BS): Vogel Gryff from 10:45 or so. Just a small headsup for those in the centre of Basel this Wednesday and fancy a long lunch. 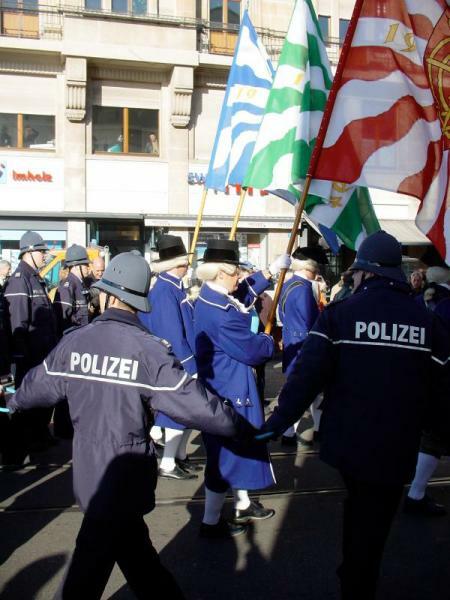 The 27th is Vogel Gryff, a traditional festival organised by the three honourable Societies (Ehrengesellschaften) of Kleinbasel, which are called "zum Rebhaus", "zur Hären" and "zum Greifen". 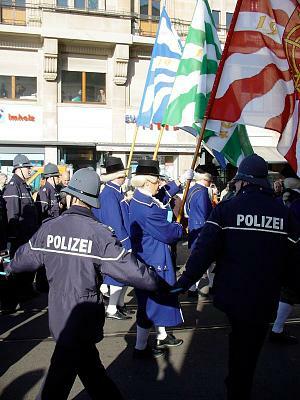 On this day the three heraldic figures "Vogel Gryff" (Griffin), "Wild Maa" (Wild Man) and "Leu" (Lion), accompanied by three drummers, three standard-bearers and four jesters, who collect money for the needy, parade through Kleinbasel, the part of the city that lies on the right-hand bank of the Rhine, performing their traditional dances along the way. 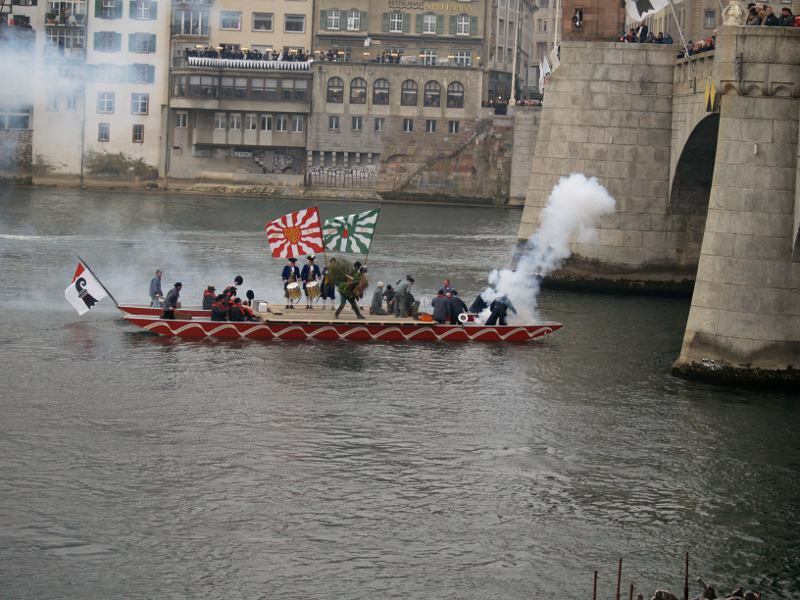 The day starts just before 11 when a boat carrying the ensemble above fires cannons as it passes middle bridge and then lands at Klingental to start the day. The "parade" then makes its way onto middle bridge for its yearly "2 fingers up" to Grossbasel before it continues though Kleinbasel performing at various locations (mostly outside bars - see note below for times). The police put on for one-day only the old traditional style English bobby hats. The Fisherstube Brewery brews for one day only a very nice bock beer. If you want to see the "dance" at another time of the day this route plan has the locations and times on it. It may not have the "big bang" of Fasnacht etc, but I like it and thought I would share some information about it . Re: Kleinbasel (BS): Vogel Gryff from 10:45 or so. Today is this years Vogel Gryff. 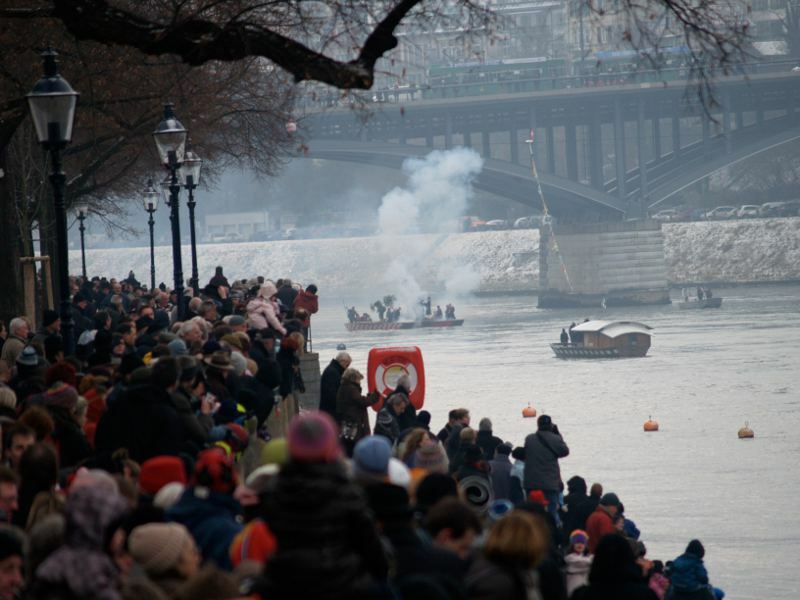 For those who live or work in the centre of Basel and have never seen it, You may wish to to head down to the Rhine over an early lunch to view this years event. Just a bump reminder of one of Basels lesser know traditions. Tomorow (Friday) is this years Vogel Gryff. Just my normal bump reminder of one of Basels lesser know traditions. Unusually this year it falls on a Saturday, This Saturday . But most of the "extravagant" stuff is just before lunch in and around the middle bridge.